Jim Kelly had charm, grace, good looks and wit, added to his Karate, they were an unbeatable combinatiion. His death on June 29 certainly caused a ripple in the Martial arts world. In the movie, "Enter The Dragon," starring charismatic Martial arts master, Bruce Lee, there was another Martial artist. He was as bold, charismatic and as exciting to watch as Lee. Perhaps, that is why his character, Williams, was killed off. Yet, before his final scene battling the evil Mr. Han, Williams acquitted himself well. He had style, he had grace and boy did he have one liners. In reality, Williams was played by James Milton Kelly. known as Jim Kelly. Though he was an actor he was also the real thing. He was a Martial arts champion. He won his fame on the tournament circuit. Most fans of Martial arts movies know him from "Dragon." I became acquainted with his work when I saw a movie called "Melinda." In that movie he used his Martial arts to aid a friend in defeating the murderers of his girlfriend. The girlfriend was Vonetta McKee, as I recall. Actor Calvin Lockhard played the friend. I was fascinated watching Kelly demonstrate his skills. Martial artists are drawn to the art, mesmerized by public displays of it. They feel connected to the art and the person who displays it well. The Martial arts expert and master radiate an air of divinity, of immortality, perhaps like a preacher. When a master dies it seems like a hole opens in the universe and we are left momentarily powerless. On June 29, 2013, Jim Kelly lost his battle against a foe even he could not defeat...cancer Yet, in many ways, even his death is a victory. It calls to mind his considerable accomplishments, not the least being his inspiration to those who were coming behind him. They needed a hero. They needed to be that hero. Jim Kelly showed them that they could be strong and talented and look good the whole time. 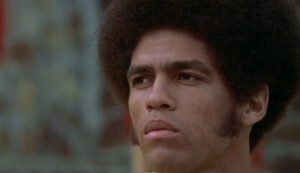 Bruce Lee was universal in this regard but Kelly was the first black movie Martial artist. He brought the promise home. He made the power of the art his own. By this very feat, Jim Kelly showed us that the "Black Belt" is accessible to all who are willing to apply themselves. Kelly quietly went about his work, He starred in "Three The Hard Way," "Black Belt Jones," "Black Belt Jones: The Tattoo," and other movies. His characters were mostly good guys, role models, with the cockiness that comes from knowing "no one does it better." When Kelly stopped making movies because he found no satisfactory scripts, he became a tennis professional. It seems suitable for a man with quick reflexes and a gift for hitting. While Martial arts fans and practitioners are mourning his lost, no one will miss him more than his daugther and mother. The lost of a family member opens a deep wound only time can heal. I never met Jim Kelly in person but I never forgot him either. Periodically, I would Google him to see what he was doing I sent him love. Until the anouncement of his death and age, I did not know we were so close. He was only two years older than I.
I was living in New York when his star arose, and my own Zen/Martial path had begun. It was my practice to receive all of those who embraced The Martial Way. At the highest level we embraced the spirit of guardian angels. With faith we could go way beyond sports to be true defenders of the weak. Often movies depict such characters. I wanted it to be for real. 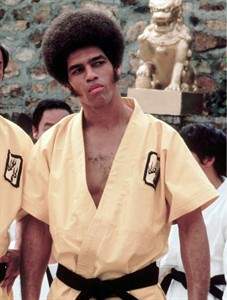 I thank you Jim Kelly for all the heroic moments on the screen, and for looking good while you did it. I am smiling now and I will always smile when I think of the celluloid legacy you left us. Inspiration is a great power, a motivator. Perhaps when the time comes for this dragon to exit, to bow out to the earth, I will bow in and visit your celestrial dojo. It sounds right, exit the dragon....enter the dragon. Jim Kelly in his working clothes, on the set of his famous movie with Bruce Lee, Enter The Dragon. The Soul Sword Zen Community and Zen Mushin Ryu practitioners honor Jim Kelly and offer our prayers to the family.